Ahhh, sleep. That thing you did before you had your bundle of around-the-clock joy. Let’s get back to that magical place where dreams are made with Cradle, the custom sleep trainer for tired babies and exhausted parents. Is Cradle Right for Me? 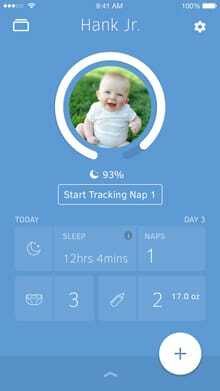 View the progress bar at any time to see your baby’s daily progress. Jump into active tracking events by clicking on your baby’s profile picture. Learn about your baby’s development, formulate strategies and know what to expect through Cradle’s robust and reliable cards/FAQ. 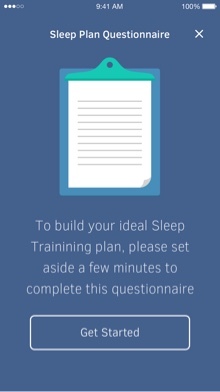 Fill out a short questionnaire to build your personal sleep plan. Two weeks is all it takes for you and your baby to catch more Zs than a zig-zagging zebra. Sleep Training and Brain DevelopmentBrain development is linked to sleep and sleep training helps. The National Sleep Foundation knows their Sleep. And they say sleep is essential for brain development and meeting developmental milestones on time. Children who learn to put themselves to sleep at night also show better ability to self-sooth during the day when compared with those who primarily use parental support for sleep. Mental & Physical HealthThe link between a good sleep schedule and increased health. Higher levels of continuous night sleep (11-12 hours/night) are associated with increased learning abilities, focus and attention skills, and overall physical health. We know you’re ready for a full on snoozapulooza. But is your baby? 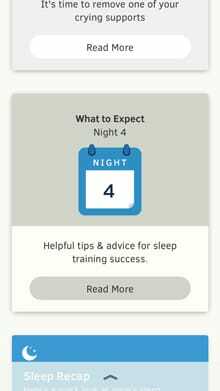 Use this simple Health Screener to identify common health related roadblocks to successful sleep training. Cradle is intended for babies under 24 months old. You may want to consider an alternative sleep training solution. Does your child display snoring or heavy mouth breathing? You may want to check with your Primary Care Physician for allergies, sickness, or enlarged tonsils/adenoids before Sleep Training. Does your child exhibit vomiting, back arching, or excessive spit up? You may want to check with your Primary Care Physician for reflux, food allergies (i.e. reactions to allergens in breast milk or formula), or general GI distress before Sleep Training. Does your baby exhibit less than one “poopy” diaper per day? You may want to check with your Primary Care Physician for food allergies, GI distress, or dehydration before Sleep Training. Does your baby’s diaper have white mucus or blood in the bowel movement? You may want to check with your Primary Care Physician for food allergies, sinus infection, or GI distress before Sleep Training. Does your baby’s diaper often contain “watery poops” or diarrhea? You may want to check with your Primary Care Physician for food allergies or sickness related to GI distress before Sleep Training. Does your baby have eczema or body rashes? You may want to check with your Primary Care Physician for food allergies or environmental allergies before Sleep Training. Can your baby support their body using hands/forearms during tummy time, bring toys fluidly to their mouth and turn their head side to side? Check with your Primary Care Physician about possible concerns with motor development. Download Cradle from the app store and get started. Always consult your doctor before beginning a sleep program. After spending the last ten years providing therapeutic sleep support to tired parents and their children through in-home consultative services I felt strongly that there could be a way to streamline the experience and expand the number of families that could be helped. I continually hear the same stories from parents about reading different sleep books, searching out parenting blogs, and asking friends for advice only to end up more confused about sleep training than when they began. One particular parent many years ago made a comment that completely changed the way I viewed the sleep process- she asked, “If I taught her one set of ways to go back to sleep then why can’t I teach her a new set?” She felt that moving from nursing and rocking her baby back to sleep to nothing at all was too rough of a transition. From that family forward I began developing a system that allowed the parent to introduce new associations around falling asleep that the baby could eventually replicate without assistance. Babies learn sleep associations fairly quickly but those associations are usually tied to skills that require parent support, like rocking, nursing, and holding-none of which the baby can do alone. Now, after parents introduce the new pattern, the baby not only changes what is expected from the parent, but has a new set of skills to go back to sleep that can be done independently!